The Tehachapi Unified School District's main office is at 300 S. Robinson St. 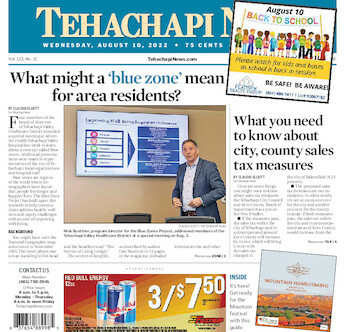 The Tehachapi Unified School District is partnering with the Kern County Superintendent of Schools Office to combat findings that show TUSD has high suspension rates, chronic absenteeism and nearly half its graduates lack career and college readiness. Each school in the district is taking measures to improve red and orange ratings — which signify poor performance — on the California Dashboard, which looks at every school district in the state to evaluate whether schools are meeting students' needs. “We feel we have a lot of support,” said Paul Kaminski, TUSD's interim superintendent. This partnership comes after a KCSOS representative went to a TUSD board meeting in December and said TUSD had to improve in these areas. A local group of 12 administrators, teachers and other qualified personnel are meeting through April to discuss how to help students, Kaminski said. The dashboard reports that districtwide, 4.5 percent of students were suspended at least once in 2018. A sizable 13.8 percent of students were categorized as chronically absent, with students with disabilities or homeless in the top category. And 48 percent of the high school graduates weren't ready for college or a career. Some ways to help ratings go up in the future are in the works. Administrators are seeing results when implementing the Alternative to Suspension program in which students are put in a separate class to help them identify bad behavior and change it. Ways to help foster and homeless youth are being addressed, as well as helping English learners in after-school programs, partnering with Cerro Coso Community College for dual enrollment classes and checking to make sure the data reflected in the Dashboard is accurate. In the next few weeks, the district will conduct interviews for a deputy of security and truancy. The person who fills that position will address chronic absenteeism, work with local law enforcement, monitor students and visit students' families at their residences if needed, said Sharon Heitman, principal of Jacobsen Middle School. The Alternative to Suspension program, in effect for a year, is helping reduce suspensions. “We are doing much more in-school suspension versus at-home suspension and we already know that we at least cut our suspensions in half from last year,” Heitman said, referring to the middle school. In the last five years, the district has expelled an average of 15 students per year. This process is lengthy and “pertains to specific acts that warrant an expulsion,” said Kaminski. He added that many steps are taken to help students correct their behaviors before this happens, such as discussing attendance and current grades and holding school site hearings and parent meetings before the matter comes before the school board. There are more than 100 foster youth and homeless students across the district who may need extra help. “In any adverse situation a student is in, whether they are a foster youth or homeless, once they meet that criteria, we meet as a school site team to assess how to help,” Tehachapi High Principal Scott Heitman said. At the high school level, Assembly Bill 167 helps to cut down the graduation requirements from 230 to 130 credits in order for foster students to receive their diploma, added Scott Heitman. “The idea behind this is if the students transfer to different schools or houses it can be very hard for them. They can take main courses and not many elective courses to fulfill their graduation requirements. However, it can impact them if they want to go to a four-year university right after high school, but it will not impact them if they are going to enroll in a trade or vocational school,” said Scott Heitman. English learners are also being helped with after-school programs to understand the material, said Kaminski. At Tehachapi High School, many classes offered are part of programs for dual enrollment at Cerro Coso, linked with the Career Technical Education program or the Advanced Placement college-level classes for which students can take tests to receive college credit. “It’s a win-win for both of us and they do a great job in working with us and being flexible to meet the needs of students and meeting the needs of the community,” said Scott Heitman. It's expected within the next five years for a student to be able to obtain their A.A. degree and high school diploma at the same time, but that still is in the works, said Heitman. The Tehachapi Unified School District has students from all backgrounds and situations. The total enrollment is recorded at 4,454 on the California Dashboard.